Max. Pulling Tension: 131 lbs. Nom. 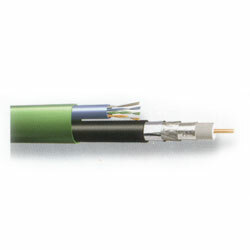 Overall OD: .335" X .535"
Conductor Material & Diameter: 18 AWG solid bare copper covered steel, .040"
Dielectric Material & Diameter: Gas injected foam polyethylene, .180"
Shield type: 1st layer - Bonded duofoil, 2nd layer - 80% aluminum braid, 3rd layer - Bonded foil with shorting fold. Jacket Material & Diameter: PVC (Black), .275"